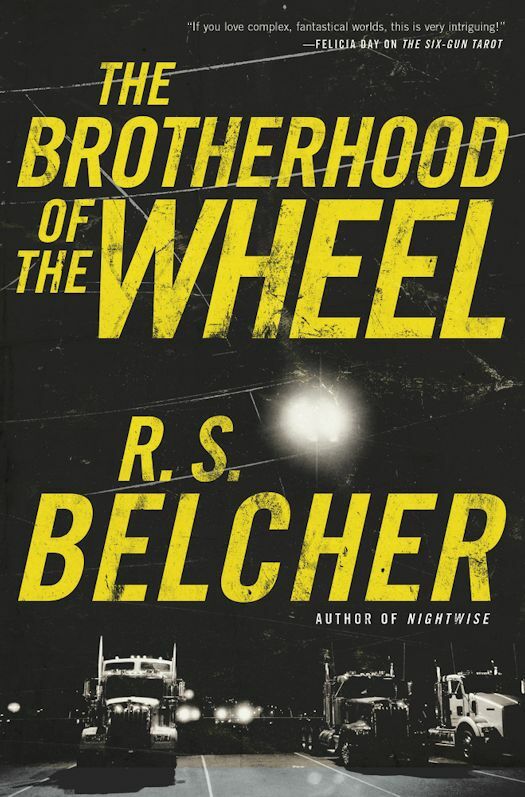 R. S. Belcher has four published novels: the Golgotha novels Six-Gun Tarot and The Shotgun Arcana, his first dark Urban Fantasy, Nightwise, and now The Brotherhood of the Wheel which is set in the same world as Nightwise and is the start of a new series. Jimmie Aussapile, one of the main characters in The Brotherhood of the Wheel, appeared briefly in Nightwise. Jimmie is a trucker and also part of the Brotherhood - modern Knights Templar who keep the roads and travelers safe in the modern world. This harkens back to why the Templars were founded in the early 12th Century. Throughout the course of the novel Belcher provides some of the history of the modern Brotherhood and it is truly fascinating. Jimmie picks up a hitchhiker that kicks off the main events of novel and his search for missing children. Along the way his journey collides with that of Lovina Hewitt, a Louisiana State Police investigator, and Hector Sinclair, a member of Blue Jocks Motorcycle Club. Jimmie is the most straightforward of the characters. He's a good man dedicated to the Brotherhood who loves his family deeply. His love of his family sometimes creates doubts about the danger he puts himself in for the Brotherhood and alternately hardens him to keep on doing the work of the Brotherhood to protect those who need protecting and to protect his family. The case of the missing children is much bigger than he at first suspects and will lead him into to unexpected places and dangers. Lovina Hewett is also on the hunt for those who hurt and take children. She is obsessed with tracking missing kids. She's tough, intelligent and determined. She's also a veteran with skills that come in handy as an investigator. But she seems to more than that, perhaps more than human. Hector Sinclair, called Heck, is an angry young man with issues apparently caused by his time in the Marines. He's more of a shoot first, ask questions later guy, but he gets the job done. There are more questions about who or what he really is than there are about Lovina. There are some terrific secondary characters who are integral to the story and interesting in their own rights and some very surprising characters as well. Belcher references several urban legends in the novel and the mythological underpinnings of the story are truly outstanding. Belcher has taken myths and transformed them into the modern world in deeply frightening ways. There are some truly scary and creepy moments in this novel. I enjoyed the early chapters during which I got to know more about Jimmie, Lovina and Hector before they come together. Once they do events starts unfolding more quickly and things go from bad to very very bad extremely quickly. The pace is often breathtaking. The depth and the layering of myth and legend on our world is exceptional. Belcher resolves the main story of the missing children resoundingly but leaves questions to be answered in further novels. The Brotherhood of the Wheel is exciting, intricate, riveting, and beautifully written. You may need to read it with the lights on! Note: Have a list of CB Radio 10 codes handy to understand the numbers at the start of each chapter. Who and When: The contest is open to all humans on the planet earth with a US mailing address. Contest ends at 11:59 PM US Eastern Time on March 12, 2016. Void where prohibited by law. No purchase necessary. You must be 18 years old or older to enter. I've loved his prior books so excited to read this new one. I think this may be my favorite of his novels and I've loved them all! Great feature and giveaway which interests me very much. Thanks. Wow not my usual type of story but the blurb an then the review sucked me right in. Sounds like an interesting concept for a novel series, and, hey, who can't use another trucker cap? Knights Templar in semis? This sounds amazing! It looks like this novel will be eligible for the 2017 Darrell Award as well. The trucker cap makes me laugh. I swore up one side and down when I became a trucker, I would never wear a trucker's cap. Almost 9 years later, and I still haven't worn one. I guess it could be due to my not liking hats.